Posted on May 23, 2018 at 11:06 am. 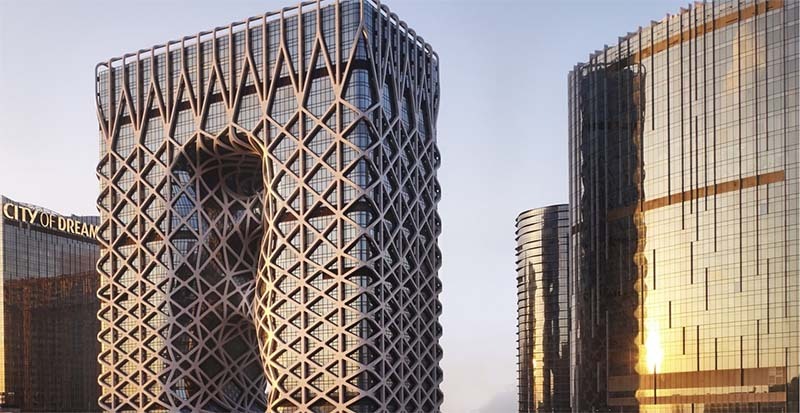 The hotel industry in Macau is set to receive a big boost with the opening of the much talked about Morpheus Hotel. Located at the City of Dreams, the hotel is scheduled to open on June 15 and will be the latest casino under Melco Resort and Entertainment’s ownership, with it set to become the flagship of the group. Morpheus Hotel will be the world’s first free-form exoskeleton-bound high-rise and was designed by architect Zaha Hadid. The hotel comprises about 770 rooms, six duplex villas, and three pool villas. Hadid is noted for her passion for curves and strong lines that are seen in the design of Morpheus. The beautiful edifice is embedded with the figure “8”, which is seen at the outside of the building and associated with luck and prosperity in the Chinese culture. An interesting highlight of Morpheus is the 35-metre high atrium that comes with strong architectural lines. The atrium contains 12 lifts, which are built to travel within the building’s figure “8”. This offers visitors a broader view of Macau as they move up and down the hotel. It also has an outdoor roof pool at level 40, about 130m above the ground. Aside from the luxurious suits and a top class experience, the hotel will also be the home to some good food. It has already announced it will house two Alain Ducasse restaurants (Voyages by Alain Ducasse and Alain Ducasse at Morpheus) both to be situated on the same floor. Morpheus Hotel will host other top class restaurants and dining spots like the Pierre Hermé Lounge and Yi, which will serve omakase menus made up of regional Chinese cuisines. Aside from this, the facility also comes with the Morpheus Spa to offer visitors the “Spa Butler” concept and a Snow Garden boasting real snow.